This mod blends the hair colors of two parents and applies it to the Offspring-Sim. This guarantees more surprise and variation than the original EA code that just copies either parent's hair color. Funfact: There are 79,228,162,514,264,337,593,543,950,336 possible hair colors. 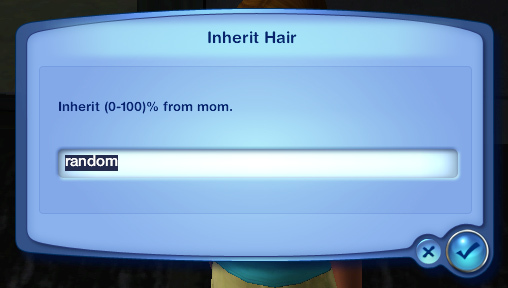 And that's just the scalp hair of one Sim. Let's make the game more colorful! Prompts you to enter a number between 0 and 100. This % value decides on how prominent the hair color of the same-gender parent will be in the mix. 87 would mean that 13% of the opposite-gender color gets mixed with 87% of the same-gender color. Just leave “random” to apply a randomly rolled mix. The mod now calculates the new hair color and applies it to the Sim. You will get a little notification in the top right corner to inform you about success or failure. This works just like the copy function in any other program. It copies the Sim's hair color to the clipboard. Pastes the hair color currently stored in the clipboard to the Sim. The displayed name is the Sim the color was originally copied from. Paste always applies the color from clipboard, not from the Sim's current hair. Hint: Copy/Paste are extra functions to make it easier to toy with hair colors, or repair them, or undo changes, or do what you like with them. They are not essential for what the mod does. Shows the version of the mod and the XML-tuning string. Toggle whether the Sim menu is displayed when you click on a Sim. Whether or not the Mod should automatically apply blended hair colors after Sims are born in the game. -Some Sims have strange hair colors. The default population of Sunset Valley has Sims with blue-blond, greenish red or black with white streaks hair colors. The mod does not detect “odd” looking hair colors, so some results might look odd as well. -The mod uses a skin color detection. If a Sim's skin is considered “dark”, it applies the darker of the two parent's hair colors. Dark refers to the EA definition: the skin tone slider is more than 66%. This value can be tuned or switched off with the XML tuning file. -The mod always sets all hair types (eyebrows, beard, body hair) to the same hair color as the scalp hair. -Blend values 0-10% and 90-100% snap to the relevant parent's hair color if that hair is considered black or white (very light blonde). -Automatic inheritance triggers with a delay of ~30 Sim minutes. How dark a skin tone has to be in order to make the mod pick the darker hair color. Affects manual inheritance via Sim-menu. No incompatibilities with other mods are known of.